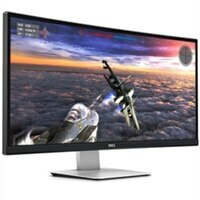 Dell UltraSharp U3415W 34' Curved MonitorPerformance ahead of the curve. An immersive panoramic experience:The DellTM UltraSharp 34 inch Curved Monitor engages you in a new wrap-around viewing experience with a 21:9 ultra-wide curved screen that offers more display area and enhanced viewing comfort. Unrivaled usability:Navigate across multiple applications and video inputs with Picture by Picture and Picture in Picture features. Above and beyond reliable:Get the most from you monitor with our Premium Panel Guarantee, 3-year Limited Hardware Warranty and 3-year Advanced Exchange Service and the Firmware Update Utility Software. Performance ahead of the curve.